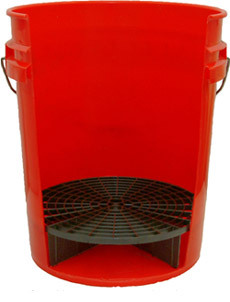 Home > Wolfgang Product Line > 5 Gallon Professional Wash Bucket with Grit Guard Available in red, clear and black. 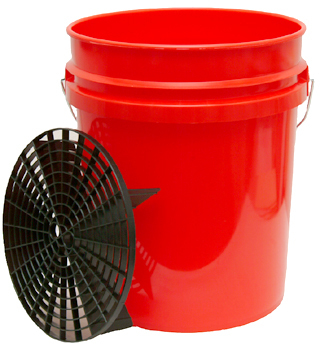 The 5 Gallon Grit Guard Wash Bucket is basic swirl prevention for any vehicle. This 5 gallon bucket includes a Grit Guard Insert, which is proven to reduce the amount of grit that is transferred back to your vehicle from the wash water. for two essential wash accessories. Simply fill the bucket with your favorite shampoo and water and place the Grit Guard in the bottom. Load your mitt with soapy water and wash as usual. When you dunk the mitt back in the bucket, drag it across the grid to remove dirt that has accumulated in the nap. The dirt will fall between the slats and settle in the bottom of the bucket. Even though you agitate the top water every time you reload the mitt with soap, the Grit Guard stabilizes the water in the bottom of the bucket so the dirt does not rise. The 5 Gallon Grit Guard Wash Bucket accommodates any size wash tool and holds enough soapy water to clean large vehicles, boats, and RVs. Use our Montana Original 10 inch Boar's Hair Wash Brush with Telescopic Handle to easily wash big trucks, SUVs and vans. *Bucket available in clear, red, and black.